Today I only post a short video and some infos for you. Want to know more? Please write and comment – I may add more information if you are interested. The topic is very deep and can be expanded if needed. But I didn’t want to make it too complicated for you to read. Spirits and hard Liquor are made of fermented fruits or grains or roots or a mixture of fruits and spirits (brandy). Spirits are always distilled. The fermentation process is similar to fruitwinemaking but different. Increasing the alcohol content with sugar is not allowed if you want to make fruit spirits. High acid content doesn’t matter if you want to make a spirit. Too much acid is acceptable here because you don’t drink the mesh. Schnaps contains at least 1/3 fruit spirit and the other part is neutral alcohol, you may add artificial flavourings. We know the Marillenschnaps which has an unpleasent bouquet of the artificial aroma. But some people seem to like it that way. Schnaps is often cheap and very drinky. 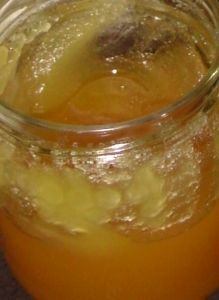 If you want to make Liqueur you add fruit or fruitjuice (or other ingredients like eggs, cream, herbs, spices etc.) to alcohol, sugar and water and sometimes artificial colours and flavourings. Liqueurs must have at least 15%Vol. and 100g/l residual sugar. Egg liqueur at least 14% Vol. More information you can find in Austria Lebensmittelcodex Kapitel B23 Spirituosen. Some recipes are fast and easy to make – BUT not very safe and suitable for long term storage. You shouldn’t give them away for a present because eggs and cream may contain bacteria and too long storage under wrong conditions may bear a health risk. You should only make them for yourself and just in time when you want to use them. They are very easy to make, so no excuse. Always remember that the alcohol content of the finished product should be at least 15%Vol. Fruit Liqueurs or others with herbs or spices are not that critical as eggs and cream. Making fruit, herb or ginger liqueur is easy and they can be stored without caution. I’ve found some cream liqueur recipes on the internet and in blogs which only contain 5-9%Vol. when you calculate the recipe and people give them away for present. So it’s only a warning. Always calculate for yourself! When you drink them right away from the mixing bowl everything may be fine but storing these beverages for a long time may become very nasty. And we all know about those presents you get at christmas, then you store them on a shelf in a warm room and you finally open and taste them in summer. Don’t do this with homemade egg and cream liqueurs! 170ml x 96%Vol. – makes 1L of 16,3%Vol. 400ml x 40%Vol. – makes 1L of 16%Vol. You can take ~ 136-137 or 140g with 96%Vol. or 368-372 or just 370g with 40%Vol. if you have not a 1 Liter bottle but a 0,7L bottle you just have to multiply this with 0,7, so simple! Fruit ports =/ Fruit Liqueur? Fruitdessertwines may be produced with addition of alcohol similar to portwine or fruit liqueur. The final product may have up to 22%Vol. A differentiation between fruitport and fruit liqueur is very difficult. Such products are called intermediate goods (Zwischenerzeugnisse) and are taxed. If you want to differentiate fruitdessertwine and fruit liqueur you may look at the residual sugar content and the overall body and complexity. Fruitdessertwines have a harmonious acid content and a bouquet from fermentation, more complex not so clear und straightforward as a mixture of juice and alcohol. Fruit liqueur often lacks acid and tastes very sweet, there is no counterpart in it. You may produce fruitdessertwines from dry to sweet but liqueurs must contain at least 100g/l RS. Fruitwines must contain a minimum of fruitjuice (often around 70%) which means that the dilution with water is very restricted and often the addition of sugar dilutes the juice solely. You need lot’s of body to compensate the high alcohol content in your fruitwine otherwise it would taste too hot and thin. Often there are higher amounts of fruitjuice because you may add concentrate especially low-acid juice. The residual sugar in liqueurs takes the task to give the beverage body. Often you add a few % glucose (Trockenstärkesirup). The Trockenstärkesirup is produced by hydrolysis of starch and contains high-molecular carbohydrates like maltodextrin which only has the sweetness of a third of sugar but adds body and thickness. The Liqueur lingers longer in your mouth and tastes fuller. The juice content must be at least 20L per 100L finished Liqueur (min. 20%). Fruit liqueurs with high juice content are very rare because the selling price increases significantly. To compensate that you have to increase the fruitflavour and colour because you only add a minimum of fruitjuice. Alcohol is often the priciest ingredient. So you have to economize on the other additives. The production of liqueur is simple and fast. It’s just mixing ingredients. Fermenting fruitwine is challenging and time consuming and something can get wrong with fermentation, it’s risky and you must have knowledge about winemaking. But on the other hand liqueurs are expensive to produce because you have to buy pricy alcohol. Producing liqueur commercially is competing with homemade liqueurs by housewives. They are simple to make. Everyone can mix the ingredients and make liqueur and you even get those flavourings and additives if you really want to. In Austria Liqueur seems to compete with fruitdessertwine because farmers only produce liqueur and not fruitwine. Often people don’t know that fruitwine exists or it’s is possible to make. They didn’t learn it and it’s not common knowledge. Liqueur is simple to make and can be produced on a low scale too if you want to expand your portfolio and often liqueurs are homemade, even by farmers. Fruits are expensive and to make fruitwine you need lots of fruit and you must be able to process it. These two products may look and taste similar but they are different – in philosophy, law and manufacturing. When you read lot’s of literature and wineguides you might think that this is the only truth. Even specialised literature for winemakers skip the whole topic of fruitwines and other wine-like beverages entirely. They are hushed up. In most wine-shops you can’t even find them. There is no knowledge about them and so chefs at restaurants and wine-traders are often not willing to integrate them in their portfolio. They have learned that they are no real wines or they couldn’t learn this because for some pepole in the Wine World they don’t exist. Winemaking from grapes is very old and grape juice ferments very easily into more or less stable wines with at least 10%Vol. without additives or intervention of humans. When the fruit is fully ripe the sugars and acids are in balance and perfect for winemaking, even the yeast is present on the skins. You only have to wait till it’s ready to drink. Wine was made that way for milleniums of years on earth and it worked well. A modern phenomenon is the production of Single varietal Wines. In the middle ages and later they produced assemblages and blends, so called field blends. Which means different varieties with different taste, sugar, acid and ripening time. They grew together in a single vineyard. This was calculated risk and a risk management system. Because if there were losses, some varieties yielded and the different ripeness of the different varieties played together to form the average value with little variations. From a winemaking point of view blending is always the wiser way to produce wine. Blending doesn’t stand for poor quality. It depends on what you blend and for what reason you blend. It’s the final product that matters. The whole is more than the sum of it’s parts. Think of Champagne, Bordeaux, Chianti, Edelzwicker from Alsace, Rotling and further Schillerwein from Germany and Gemischter Satz from Austria. In the early 1900 after the vine pest phylloxera devastated Europe and destroyed whole vineyards. The people sought after other sources to make substitutes. Wine was rare and expensive. The Frensh were so afraid of other beverages that they only allowed grape wine to be called wine (vin) and created a new wine law to protect it. Honeywine was called hydromel and wine from apples cidre. So no misconception was possible between real wine and …. well … other inferior alcoholic beverages. The truth lies between. Most fruitwines can compete with grape wines and even beat them in competitions when it comes to taste and overall acceptance. Fruitwines are more appealing to people and they simply taste good. There is no wine knowledge necessary. Everyone can drink it – not only wine snobs who pay millions of dollars for a bottle of chateau wine. The aromas you are looking for in grape wines you can simply find in fruitwines and there are no strict rules – fruitwines are made to enjoy and for Joie de Vivre! What happened after the vine pest? The French cross-bred European vines with American wild vines to make the plants more resistant against phylloxera and the hatred mildew. The so called French-American Hybrids or interspecific Hybrids came into being. The Kuhlmann hybrids like Marechal Foch, Leon Millot but also the Seibel grapes Chancellor, De Chaunac, Chelois, Cascade. Chambourcin by Seyve or Baco Noir from Francis Baco or white grapes like Seyval blanc or Villard blanc, Vidal blanc or Vignoles (Ravat 51). They produced reasonable wines in cooler climate and were resistant to deseases. But the French didn’t like the taste and foxiness of some cultivars so they used biotechnology and grafted european vines on american rootstocks and defeated the phyllaxera. Since 1930 lot’s of french-american hybrids were annihilated and the vineyards renewed with grafted European vines (on american roots). 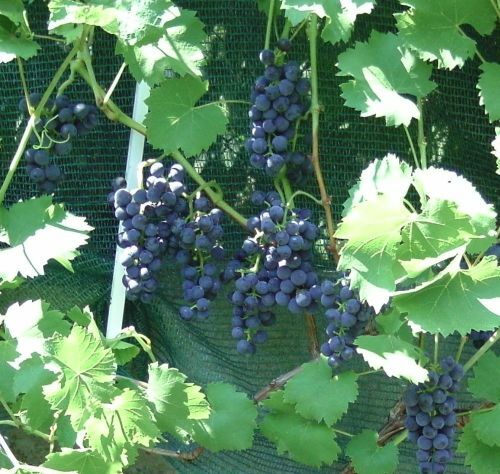 The law forbid the production of wines from hybrids. At least in Nazi Germany and Austria they wanted no Native American Wines and inferior cross-bred varieties. But some vineyards outlasted and still exist, like in the Midi in France. In the United States, Kanada and Great Britain, as well as other countries, French-American-Hybrids are still used nowadays – for good reason. They produce wine in very cold climate and they produce reasonable quality and best of all mostly without pest control. The difference between America and Europe is that the Americans don’t differentiate: grape is grape. 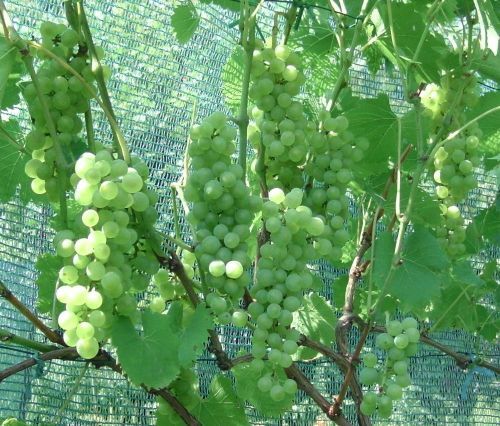 They have – what we call Uhudler in Austria – native grapes from the Labrusca family. They are used for juice, jelly, pie, soft drinks and candy because they have a very unique taste. But some use them for wines too. Rose wines from Concord and Catawba grape or Dessertwines, Icewines and Sparkling Wines from the Delaware grape. French-American Hybrids are used in the North. Sure they lack quality in some kind but it’s the challange for the winemaker. Some red varieties have lots of colour but no tannins and they are usually more acidic than normal wines. They tend to taste unbalanced and the aroma is sometimes a bit strange. So it’s hard to drink Baco Noir or Marechal Foch when you like Merlot or Zinfandel. Sometimes it’s better to make superb rose wine than red wine or to blend different grapes and wines to smooth out the taste and they are great blenders. French-American hybrids are not bad nor do they taste bad – you only have to learn to tame them. They can yield very competitive wines, even red wines in the hands of a skilled and experienced winemaker. Nothing for amateurs. Own experience. I tried to make Red Wine from a grape in my garden that was labeled „Regent“ and treated it like the german grape Regent (which is a deep coloured mild, low-acid merlot-like red wine with cherry notes) but years later I found out by online research that they sold Marechal Foch vines. I couldn’t believe that I lost my winemaking skills and being unable to make red wine from the Regent Grape. No Regent. I was very disappointed. At least it was not my fault. The whole description of the Kuhlmann hybrid fitted and underlined my suspicion. No you can’t make easy red wine from this grape – no way. The juice is very dark coloured, even black (normally red European grapes have white juice!) so you would think that this makes a very ripe, mild and smooth wine. Nope. Mine had too much acid but the Gamay Character of a Beaujoulais Noveau was present. I’ve learned much – The Two Winebrothers have interesting things to tell about this grape variety – and then made the wine like the Americans do it. Use the best grape for the best job. I made a Rose Wine from the hatred Marechal Foch grapes and blended it with a red muscat variety called Muscat Bleu. Delicious. I never want to miss that grape ever! And it works well in a blend with different more tannic red grapes also. It’s only a point of view. 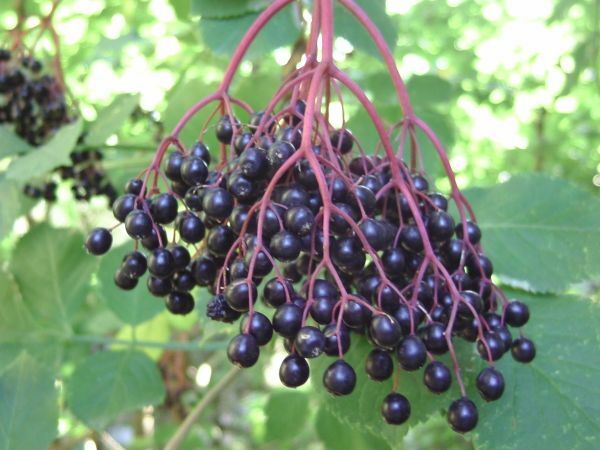 You can also make Port Wine from this grape. But I recommend Rose Wine, this always works very well especially with the higher acid. The irony of the story – you would never consider making rose wine from a very dark coloured juice. But Marechal Foch loses that colour because it lacks tannins and you get a full coloured Rose Wine. It depends on the grape what kind of Wine or Wine Style it favours. As I mentioned Regent, the new generation of hybrids from 1970 and later are called fungus-resistant (Piwi). They overcame the poor wine quality of the older french-american hybrids from early 1900. The red wines are way better and more appealing and winemaking is easier. But in general white hybrids make better wines, at least the official opinion. But there are new red varieties which are very promising. I’m a Fan of the Regent Grape. But it’s all a matter of taste. Remember: there are a lot more grape varieties out there except Chardonnay, Riesling and Pinot Noir. To be specific they say there exist 10.000 different varieties. Which is A LOT! There are also a lot of only locally planted vines like Feteasca Alba from Tansilvania, Elbling from Germany, Mavrodaphne and Xynomavro in Greece, or Rotgipfler, Zierfandler and Grüner Veltliner in Austria – to name a few. Wines are produced from grapes. But wines, fruitwines, can be made from Tree fruits & Berries too. What makes fruitwinemaking difficult is the lack of sugars and excess of acids in the fruits and most fruits can’t be pressed like grapes and need to be processed beforehand. For centuries a mixture of fruits, grapes, grains and honey were sufficient to make alcoholic beverages. But the alcohol content might not be very high. In the later 1800 century the production of sugar from sugar beets and cane sugar became industrial. The usage of sugar to boost the alcohol content of juices, grapes or fruits, might have been possible. Some minor piquettes were made to increase the output from grapes and to offer cheap „wine“ for workers in the vinyards. The pomace was mixed with water, sugar and acids, if available, and a second run was possible after a few hours or a day of extraction. This piquette lacked the quality of the main product but was a sufficient substitute for the poor. But some claim that the difference was not that significant and it was possible to make good wine from pomace as well as raisins and other ingredients. Wine laws followed and tried to prevent that manipulationin in early 1900. Nowadays it’s not allowed to produce second run wines commercially or mix second run with first run. Fruitwines must contain a minimum of sugar free extract from the fruit source to prevent excessive dilution with water. The addition of water to grapes is strictly forbidden. But in the USA and other countries they allow up to 30% of jesus units to reduce the high sugar content of grapes be get back into a normal range. Selected yeast became also available in the 1900 and 2000 century. So it was possible to make quality wines. There are wild yeasts on grapes as well as Saccharomyces cerevisiae strains. The must always started fermenting but it was not always the right strain the winner of the competion of different microorganisms and the time factor played a big role in microorganism growth. Inoculating the must with selected yeasts in the right amount was a sure way to start fermentation and to bring it to the desired end. Fruitwines are way harder to make than grape wines. You don’t have the right kind of yeast on the fruits. At least you can ferment apple wines with wild Appiculatus yeast but all other fruitwines will most likely spoil. The Usage of selected yeast is inevitable. To make fruitwines you need sugar + yeast and sometimes acids. Without these it’s impossible to make fruitdessertwines. To make Fruitdessertwines you need highly alcohol tolerant yeast strains and lots of sugar. These products don’t exist in nature. We’ve learned about Cider, Pulque, Beer, Kvass, Grains and Grasses, Sake, Tree sap like Birch or Palm wine and even vegetables and roots, nuts and also milk. Naturally a wild fermenting alcoholic beverage doesn’t contain more than 5%Vol., some contain only 1-3%Vol. Grapes may contain 10-14%Vol. but seldom more and there are only a few fruits which have a sugar content sufficient to make a beverage with around 10%Vol. alcohol. You might consider Plums or Pineapples but the list is very short. The only fruit that is naturally predestinated to make wine is the grape. And the wine may develope without any human support, just pressing the juice and waiting is necessary and a more or less sealed amphora. That’s all. Voila! In most cases you get a well-balanced wine ready to drink if the grapes were fully ripe at harvest. The grape’s ripeness alone determines the final product. So you may call fruitwines man-made or artificially made. They combine art and science. Because you need a source of sugar and yeast and you have to adjust the juice to your desire. The addition of water is often necessary to reduce the excessive acid. You have to know the whole process from beginning to the final product. Short Overview: Fruitwines are not that uncommon as you might think – you can find them around the globe! Beer has a very long history dating back till 10.000 BC. But it was not the alcohol that mattered but the nutrient value of dissolved grains that made it a healthy food – liquid bread so to say. As mentioned in the Post about Grasses and Grains, beer is one of the first beverages with the usage of biotechnology. Grains contain starch and that has to be converted into fermentable sugars by amylases. Chewing on the grains and spitting into a vat is still done nowadays in Africa or South America by natives. I won’t tell too much about the beerbrewing process or the Reinheitsgebot. If you are inquiring you can read books or find the whole history an the Internet, watch videos on youtube and so on. There are very interesting stories about Porter and how it flooded the streets of London and IPA which was used for shipping from Great Britain to India in the 1900 Century or the Brewing History of German Cities with it’s big houses with high roofs for the storage of grain/malt and big doors for the big brewing coppers where nearly everyone was his own master brewer. But I can reveal a secret: beerbrewing and meadmaking was always in the hands of women because it belonged to housework and cooking and good beer was the embodiment of her womanly skills. To make it short beer is produced by yeast, water, different grains (malt) and hop. There are different styles from light to heavy, mild to bitter and pale to dark. So much infos to fill beer blogs and to blow this posting. If you are more interested and want to try it yourself, I recommend The Apartment Homebrewer. It’s another blog writing about Brewing and offers a whole list of further informations and links about this topic. But the advanced homebrewer will pobably find more infos on the various forum’s about brewing and chatting with others. Beer was always the drink of the working class. It was massively consumed while the pyramids were built and outlasted the centuries. In the middle ages beer brewing was in the hands of monks. Later nearly every household in germany produced it’s own beer. Then big companies took over and produced interchangeable beers without USP – without uniqueness and flat taste. Today small batch breweries and small businesses arise and produce craft beers. Handmade and in small quantities with very unique taste and flavour. They play with different malts and hops and create new beer styles. Which inspire companies to produce more unique beers too and some are bringing back old recipes from 1800-1900 and brew them again. Like the Wiener Lager from the Schwechater Brauerei. Beerbrewing is a very technical but also a very creative process. Nearly everything can be different in the outcome although you are using the same ingredients. It’s like cooking. Water, Malt and hops is like milk, flour and eggs. Roasting, the kind of grains or the mixture, the length of the mashing process, the temperature of the cooking process, the hops, the water, the yeast strain and so on. Everything has an impact on the finished beer, from colour to residual sugar to bitterness and taste. As mentioned before coconut wine is rather produced from palm sap than from real coconuts. But it is possible to make wine from coconut water after the coconuts have been cracked open and the water adjusted with additives like acid, nutrients and sugar. Some wineries do that but it’s very rare. Some Homewinemaking recipes call for Almond wine (should taste like Amaretto) and other very exotic experiments but the addition of nuts (or aroma) is primary for flavouring the finished wine than for fermentation. One product better known for making wine from nuts is – the walnut. But not the hard nuts that are harvested in Autumn. No. You just harvest the green juicy nuts in the End of June. There are different recipes. Some prolong the fermentation of green nuts but the nuts are very adstringent and don’t ferment very well. So it’s only a flavouring thing too. Often it’s suggested to macerate the green nuts in wine or spirits. The product we are talking about is: Vin de Noix. Here is a recipe from Provence, France,if you want to try that at home. I’ve done it with white wine and it aged very well. You can use it as an aperitif or digestif and compare it to sherry or a sweet dessertwine depending on the amount of sugar you added. If the alcohol content is over 15%Vol. you can age it for years without loosing quality or taste. If you like it sweet and heavy – walnut liqueur, Nocino – is for you. other Nuts like pistacios are also used. No not really. But the roots and resin of the mastic tree (pistacio tree) is used in Greece to produce Mastika. Honeywine, Mead, the Nectar of the Gods, is made of Honey and Water, 1 part honey, 2 parts water. It’s allowed to add flavours, herbs and fruitjuices. In Poland mixtures of fruit and honeywines were very popular. These beverages are known as Melomels. Apple based Meads are called Cyser and Grape Based meads are called Pyment. But there are many others. In Slovakia Mead is still very popular, it’s called medovina. Mead was not only produced in the high north by wikings and norsemen but also in Greek, Asia, Africa and other parts of the World. In England, Germany and Austria some old recipes from monasteries exist which prolong the usage of herbs like pyment, hops, cinnamon, nutmeg, clove and ginger. Spiced mead is called Metheglin. Mead is often a very sweet and heavy drink comparable to sherry or vinsanto with up to 16%Vol. but there exist sweet and dry variants as well as coolers, sparkling wines and mixed beverages with beer and mead. Mead is one of the oldest alcoholic beverages. What makes the production difficult is the long fermentation because honeywater lacks trub and nutrients for fermentation and honeywater means high osmotic stress for yeast. Did you know – traditionally mead was offered at weddings and that’s the origin of the word Honeymoon. In Africa, Ethiopia, mead is still popular. They call it Tej. See how it’s made there. Nowadays new technologies are used in meaderies. The classic batch fermentation is replaced by fed-batch and column reactor processes with a continuous feed of prepared and pasteurized honeywater and immobilized yeast. Using Vegetables, Vegetable Tubers and roots for beverages is a little bit weird but not uncommon. Sugar beet (molasses) and potatoes are used for vodka and neutral spirits. Potatoes need an addition of Amylase-enzyme. Gentian spirit and Topinambour spirit are somewhat special. They are made of the roots only and need special processing and addition of enzymes too. Gentian doesn’t contain glucose or fructose but a sugar called gentianose which the yeast can’t ferment or at least very slowly. This sugar needs to be converted by enzymes first. Topinambour (Jerusalem artichokes) contain Inulin which is very healthy in your diet but also unfermentable by yeast. This carbohydrate must be converted to fructose by enzymes. Some homemade „Fruitwines“ are known from vegetables like beetroot, carrot and parsley. But garlic and onions too. Such beverages are not allowed to be produced commercially. Rhubarb wines (from the stems) are known as well and in some countries commercially made. Tomatoes are also used for fruitwine making, botanically they are fruits and not vegetables. Manioc is used for beermaking in Brazil and Cassava in South America and Africa. Both roots are toxic and contain cyanide. Special processing is required before it’s safe to eat. The enzymatic procedure mentioned in the Post about Grain is also used here before fermentation by yeast can take place. Grasses and Grains were used for beverages since thousends of years by the Sumerians, Babylonians and Egytians. Egytians used to make bread and ferment that bread mixed with water. Often chewing grains and spitting into the vessels has been mentioned. Human salvia contains amylases which convert starch into fermentable sugars. Around the globe different beverages are known which are made that way: Chicha from Maize in Central and South America, Pombe from Sorghum and Bananas in East Africa, Merisa from Sorghum in Sudan and many more. In Japan Ricewine Sake is made and in Scotland fermented grain mashs are distilled into Single Malt Whiskey. In Russia and other northern Countries Kvass is still made. But the best known product is Beer. Ricewine is not wine. Technically it’s beer. What is the difference between Wine and Beer? Well Wine is made by fermenting the natural sugars of fruits like glucose and fructose. Rice and other grains contain starch which is unfermentable by yeast and needs to be broken up into smaller pieces – sugars – that can be fermented by yeast. In Beerbrewing, a biotech process, this is done by heating malt to the point of the highest enzyme activity which is around 50-60°C. Malt contains amylases which convert starch into fermentable sugars like maltose. Rice will be polished and steamed and then mixed with Aspergillus Oryce, a mold. This so called Koji will ferment a week and then yeast and water are added. Aspergillus oryce cracks the stach with enzymes like amylases, glucoamylases and proteases and provides the nutrients for the following yeast fermentation. The next days steamed rice, fermented rice and water are added. The finished ricewine has around 18-20%Vol. and is often diluted to 15%Vol. The amout of polished rice differs in the different types of sake also. Like other „beers“ maturation and aging is required to smooth out the taste.